Objectives: The aim of this study was to investigate the effects of vitamin E and selenium (Se) on some liver enzymes, some oxidative stress markers, and the liver structure of mice using light and transmission electron microscope (TEM) following long-term electromagnetic field (EMF) exposure. Materials and Methods: Forty-eight female Balb/c mice were randomly divided into 6 groups (n = 8) as follows: control, EMF, EMF plus vitamin E, EMF plus Se, EMF plus vitamin E and Se, and vitamin E and Se groups. Mice in EMF group were exposed to EMF (3 mT and 50 Hz), 4 hours a day for 2 months. Treated mice received 0.1 mg/kg Se and/or 1.35 mg/kg vitamin E for 2 months intraperitoneally and daily. 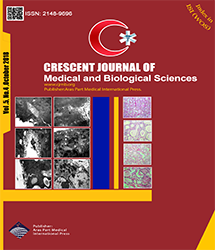 Anesthesia in mice were induced by ketamine/xylazine (10/2 mg/kg) and after taking blood samples for investigating some liver enzymes, mice were killed by cervical dislocation and their liver were removed by light and TEM for morphological studies and also evaluating some oxidative stress factors. Results: The level of malondialdehyde (MDA) increased in the liver of mice under EMF while the levels of superoxide dismutase (SOD), glutathione peroxidase (GPx), and total antioxidant capacity (TAC) decreased (P < 0.05). Treated EMF groups by vitamin E plus Se and vitamin E alone significantly improved the levels of SOD, GPx, and TAC (P < 0.05) while treatment with Se did not result in a significant effect. Histopathological analysis revealed that the livers of the mice" that received vitamin E plus Se and vitamin E had fewer morphological changes compared to those of EMF groups. Moreover, some liver enzymes such as serum aminotransferase (AST), serum alanine aminotransferase (ALT), and alkaline phosphatase (ALP) significantly increased in the EMF group in comparison with those of other groups except for the EMF group treated with Se. Conclusions: The results of the study indicated that although Se had no significant effects per se, vitamin E and vitamin E + Se significantly reduced oxidative stress and some liver enzymes.